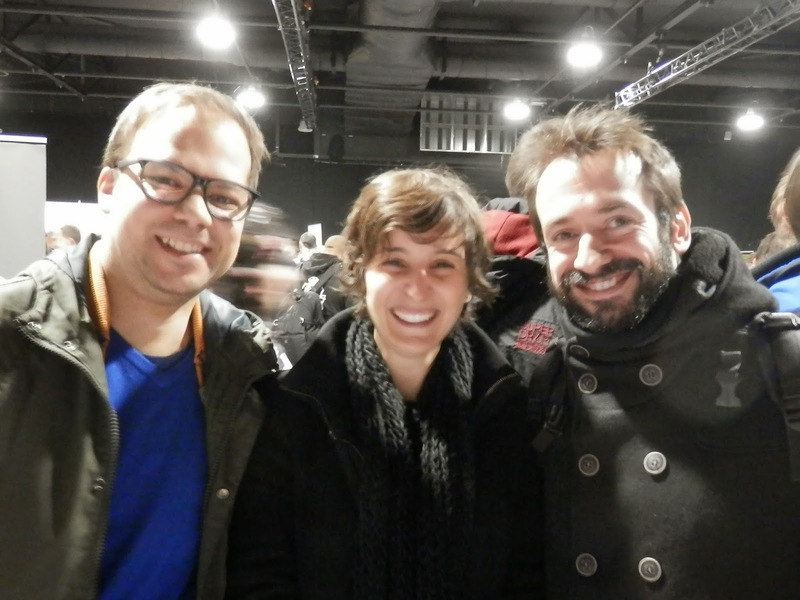 Moments of Adventure: Thought Bubbled 2014! TB14 with the new TB TeePee! 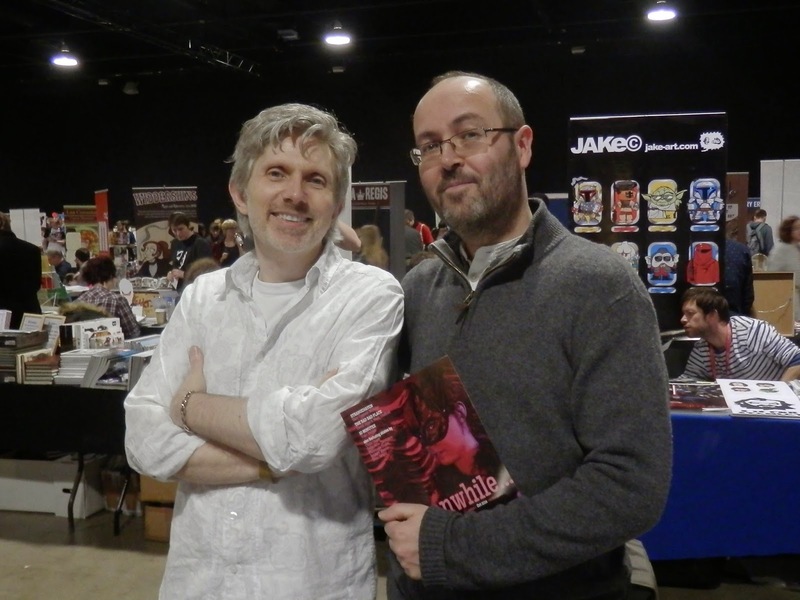 And relax, or maybe I should say stop smiling as that's all I've been done since last week's wonderful Thought Bubble Comic Arts Festival in Leeds, or TB14, to give it its hip tag! Accent UK have been lucky to attend and support each and every Thought Bubble since its modest 2007 start in Leeds Town Hall basement and while its had its up and downs, (which I commented on last year,) at TB14 everything really seemed to come together to finally deliver the potential the show has long promised. Build it and they will come....TB's TeePee! 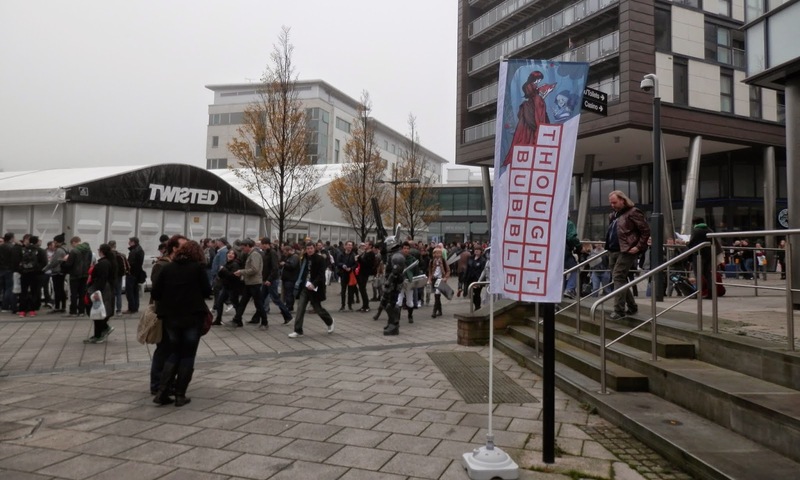 Now don't get me wrong, Thought Bubble has always been one of the most enjoyable and inclusive comic conventions/festivals in the UK but rather strangely, for us, has never produced the level of sales that other, less celebrated shows have. A lot of factors affect this and while Dave and I are experienced enough not to purely judge the success of a show on sales alone, it has been a puzzle and we've often deliberated whether its down to location, attendance, competition or maybe just fatigue, coming as it usually does, at the end of a long convention season. Well whatever the reasons, TB14, blew all our doubts and expectations away, it may have been the innovative new layout - hello TB Teepee! - an increase in numbers or maybe, just finally our range of books 'clicked' with its audience but our sales started briskly with many return readers and steadily carried on the whole weekend. 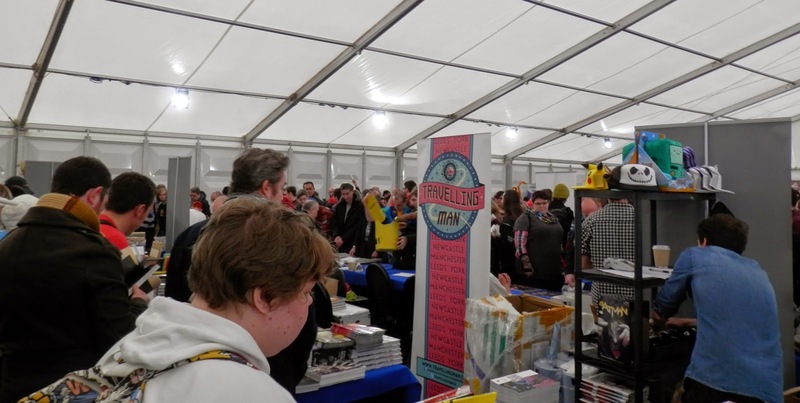 A quick tally at the end of Saturday surprisingly revealed that we'd comfortably thrashed the whole two days of TB13, and by the festival's close we'd more than doubled last year's numbers! 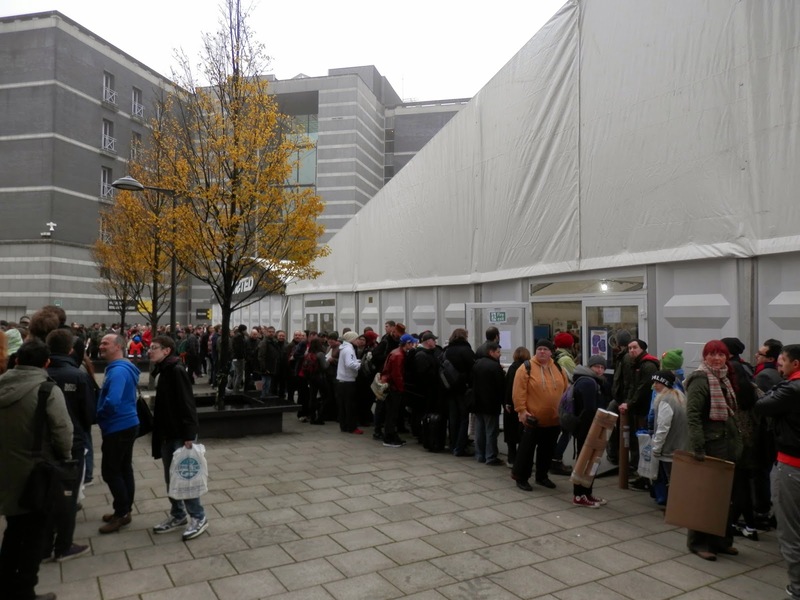 Most 'long-time' exhibitors we spoke to were similarly happy but one or two and a few of the newer ones were more restrained in their praise with some table placements and guest queueing said to be problematic for some. 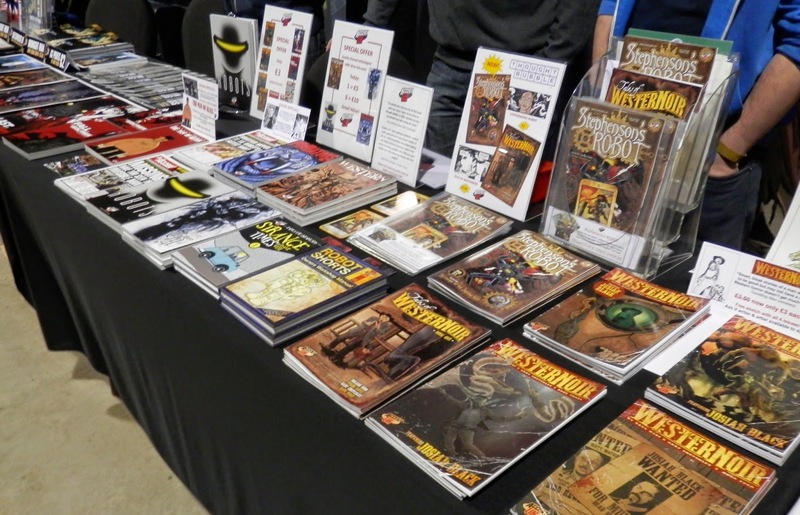 I suppose the truth is that with an eye-watering 400+ exhibitors, most with new books, the TB14 competition was fierce and sadly punters have only limited funds so there will undoubtedly be a few casualties, which maybe applies to us too in our previous TB outings? Certainly I know that despite having a few wanders around I missed seeing lots of people that I'd hoped to catch up with and again failed to see any panels or any of the guests - with a brief exception of White Death's Robbie Morrison and The Goon's creator Eric Powell - which perhaps indicates the scale to which TB has grown. 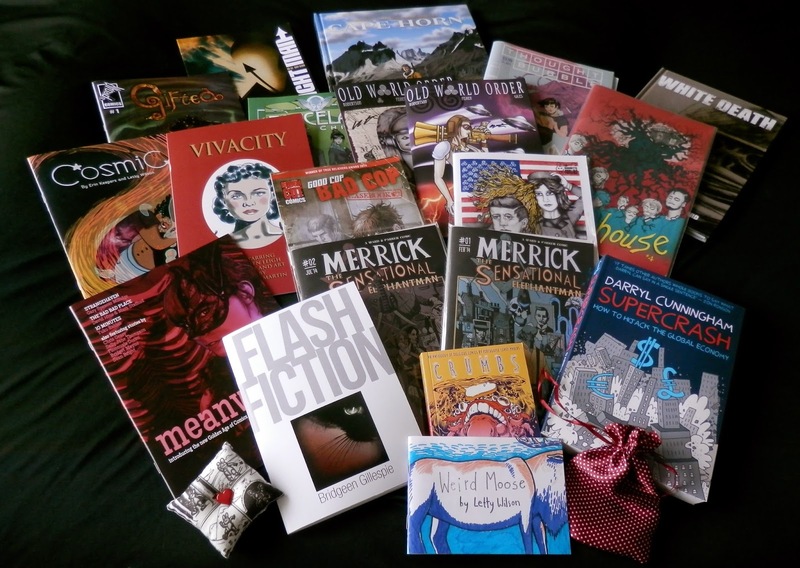 The new books on the table - note WesterNoir book 4 sold out! 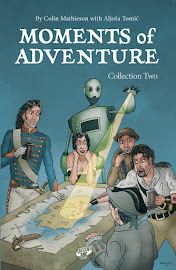 New books always seem to go down well at TB, and this year Accent UK had two, Tales of WesterNoir and Stephenson's Robot, as well as the latest WesterNoir issues which had debuted earlier in the year. 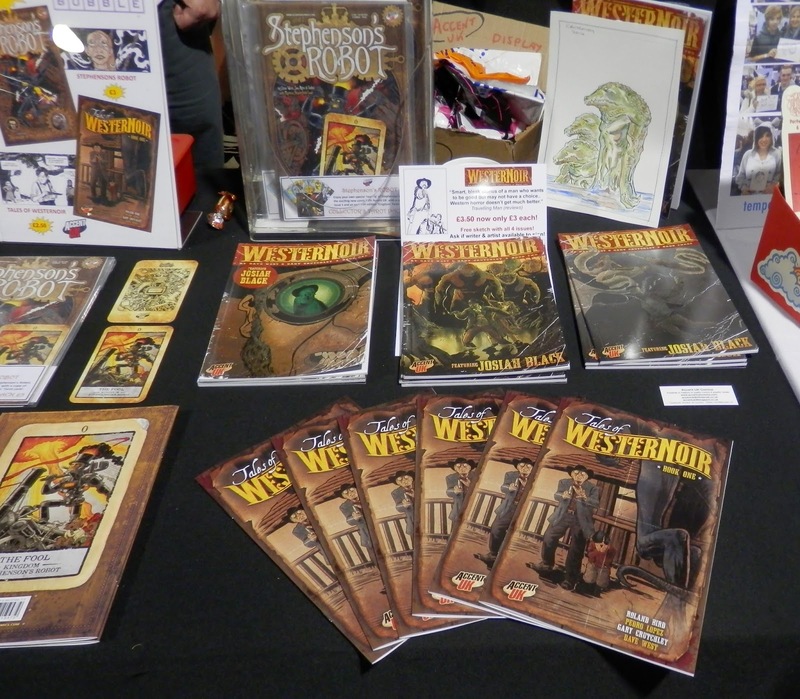 Dave and I were again joined by Scott and WesternNoir artist Gary Crutchley, who's enthusiasm is contagious and grin grew bigger and bigger as the WesterNoir sales continued, selling out of the latest, Book 4 on Sunday afternoon. Andy, Dave and Scott raring to go! 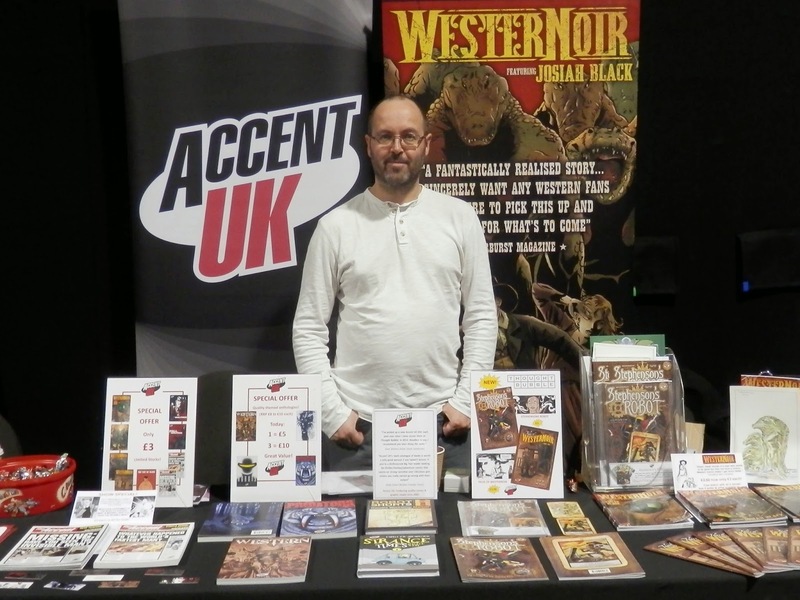 Our table neighbours this year was none other than Andy Bloor, Wolfmen artist and Accent UK book designer, who with writer and fellow AUK contributor, Mo Ali were launching their debut book Midnight Man which seemed to sell very well at the show. On the other side was familiar convention face and another talented AUK contributor Richy Chandler who is really prolific at the moment and one of the UK's rising stars. Further down was another rising star, Sally Jane Thompson, but such was the busy nature of the show, other than a wave and smile I didn't get the chance to chat. 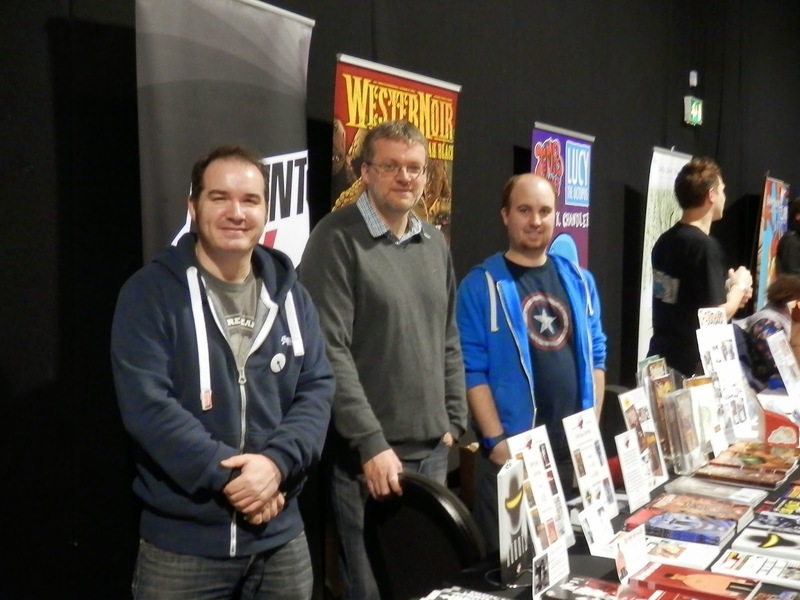 I was though able to catch up with many familiar faces at the show and for once won't attempt to list them all but special mentions for recently 'discovered' creators Danny McLaughlin and the Irish Uproar Comic Crew, Neil & Anna of the Scottish Treehouse Comics Crew, fellow Dundee graduate, Letty Wilson (who was selling the terrific 'Weird Moose' comic I saw her draw page by page at Glasgow Comic-Con in the summer! 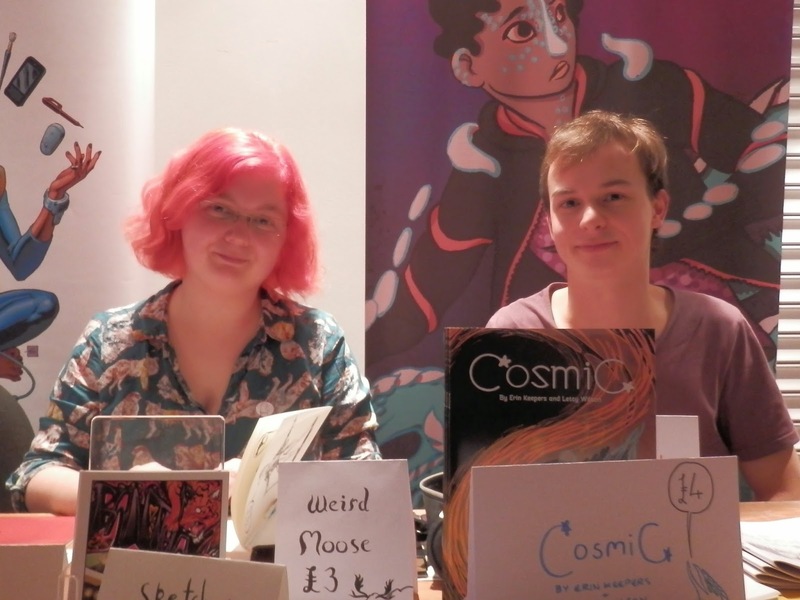 ), Erin Keepers and the delightfully talented Sara Dunkerton (more of whom in a later post!) who were all enjoying making their Thought Bubble debuts. Also pleased to catch up with new comics dynamo Jessica Martin who launched her Vivacity book and the returning talented Portuguese trio, Andre Caetane, Ines Galo and Antonio Silva. Returning TB stalwarts included Sean Azzopardi, Matt Brooker (D'Israeli), Mark Buckingham, Gary Spencer Millidge celebrating Strangehaven's welcome return, Selina Locke & Jay Eales, Gary Northfield and the unexpected appearance of the awesomeness of Bridgeen Gillespie whom Dave and I had somehow missed last year and promptly fell out over her last Kate Bush pocket mirror - only joking Bridgeen, I think Dave's going to surprise me with it for Christmas! 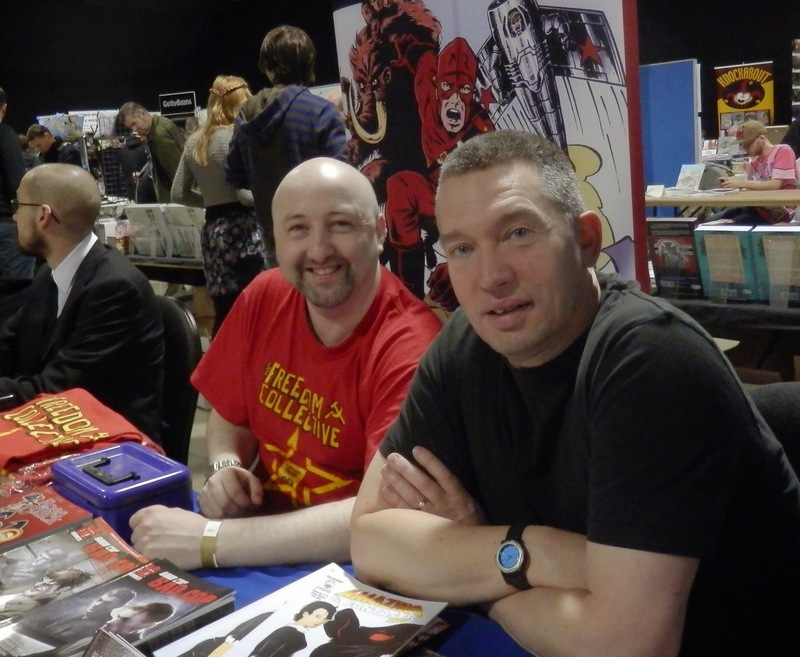 Mark Buckingham & Gary Crutchley catch up! I should look happier here - see the gaps of sold out books! I could go on but for Dave and Gary's thoughts on the show go here and here and there will I'm sure be lots more reportage out there for those who want it. 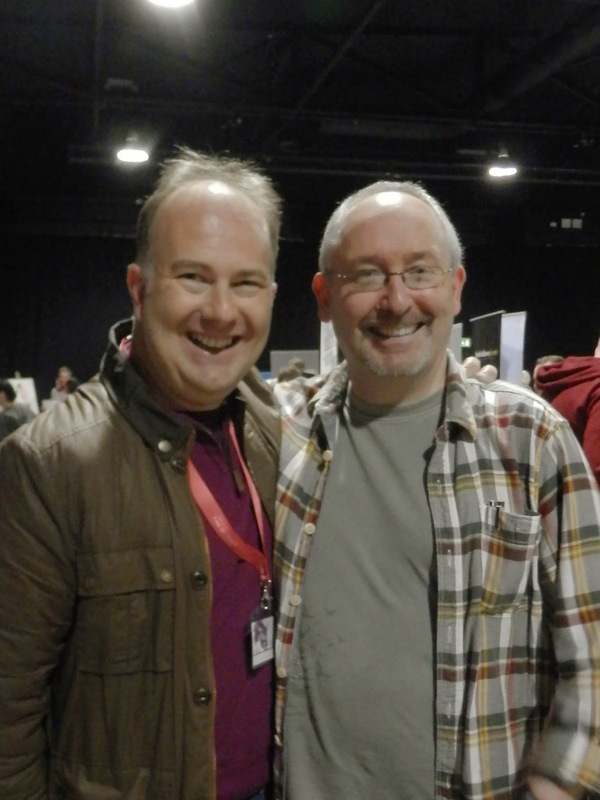 Needless to say, we had a great time and for us, TB14 has finally cemented its position as the UK's most important and fun pure comics show, well done all concerned, a perfect way for us to finish the 2014 convention season. The obligatory TB14 haul photo! Couldn't agree more. It was indeed a corker of an event. Cheers Gary, a great show and a great way to keep us all inspired over the winter. Thanks again for your company. P.S Its your round next!